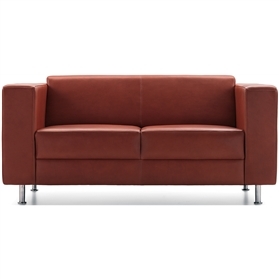 MAXA IS A CONTEMPORARY SEATING RANGE THAT FEATURES BOLD SHAPES AND DEEP CUSHIONS FOR ADDED COMFORT AND LONGEVITY. Maxa is available with polished aluminium legs, constructed from a solid hardwood frame and is manufactured with CMHR foam throughout. Maxa is available as an armchair, two seater or three seater option and can be upholstered in a choice of fabric or leather.